Muslims, Sikhs, Christians, Buddhists, Jain and Zoroastrians (Parsis) have been notified as minority communities under Section 2 (c) of the National Commission for Minorities Act, 1992. A total of thirty (30) lakh scholarships are targeted to be distributed as ‘Fresh’ Scholarships, besides, Renewal scholarships. The distribution of scholarship among the States/Union Territories will be made on the basis of population of minorities in the States/Union Territories as per Census 2001 for 2017-18 and as per the population of minorities in the States/Union Territories of Census 2011 for 2018-19 and 2019-20 (as per Appendices- A & B). ii) If the physical target of scholarship for a particular minority community in a state/UT is not utilized, it will be distributed among the same minority community in other States/UTs strictly in accordance with merit and without disturbing the national ratio for the Community. Any unutilized community quota shall be distributed amongst other communities again in accordance with merit and without affecting overall national quota. The scholarships shall be provided for the entire course. Maintenance allowance will be given as fixed lump sum amount in an academic year (as per para-9 below) for 2017-18 to 2019-20. Actual financial assistance will be provided for admission/tuition fee and maintenance allowance as given below subject to a maximum ceiling indicated against item concerned. The scheme is being implemented/funded by Ministry of Minority Affairs through the States/UT’s Administration. Scholarship will be available to the students of minority community studying in Classes I to X. An Income Certificate, issued from a Competent Authority in the State/UT Governments is required in respect of parent/guardian of the student. parent/guardian of the student is required. The continuance of award (for Renewal applicants) will be subject to securing 50% marks in the previous years examination. Maintenance allowance will be provided to hostellers and day scholars. Scholarship will not be given to more than two students from a family (applicable for all Scholarship schemes meant for minorities under this Ministry taken together). If a student is found to have obtained a scholarship by false statement, his/her scholarship will be cancelled forthwith and the amount of the scholarship paid will be recovered by the concerned State/UT Govt. The course/tuition fees and maintenance allowance will be credited to the student’s bank account directly under Direct Benefit Transfer (DBT) mode. A student shall be eligible for only one scholarship out of all the available Scholarships of Central Government meant for SC/ST/OBC/minority. The amount of Administrative Expenses (@ 1%) for States/UTs in subsequent year shall be released after receiving the Utilization Certificate for the previous years. It will be necessary for the eligible applicants to provide Aadhaar number while applying for the scholarship and in case, an individual does not possess Aadhaar one can provide the details of alternative identification documents, as stated in the Gazette Notification- S.O. No. 1284 (E) No. 1137, dated 21.04.2017 (as per Appendix-C). 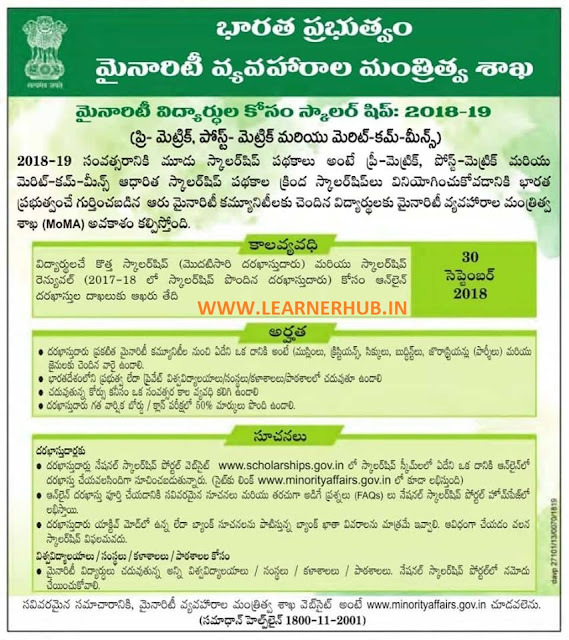 Students who have entered Aadhaar in their online application correctly and Aadhaar seeded with any of their bank account, in such cases the amount of scholarship will be credited to Aadhaar seeded bank account only (though student has mentioned any other non-seeded bank account in online application).